This game was released in 1999 and is the fourth game in the series. We are somewhat familiar with this series already. Previously, we reviewed Road & Track Presents – The Need for Speed. That game got a somewhat mediocre review thanks in part to its limited gameplay. 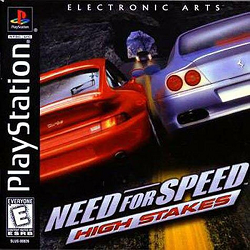 We then reviewed Need for Speed II. That game received a barely passable score thanks in part to a rollback in features, limited gameplay and dated graphics. After that, we reviewed Need for Speed III: Hot Pursuit. While the game brought back some of the features that were sorely lacking in the previous game, it still only got a mediocre score thanks to limited gameplay. So, we wondered if this game does manages to finally turn things around in the series. The big selling feature is what is hinted in the title: High Stakes. There is a high stakes mode to be found in the game. The idea is that you race against an opponent and the winner takes the losers car. Obviously, that does sound exciting. Unfortunately, like Hot Pursuit, this feature comes with a bit caveat: it is only found in two player mode. Both players need a memory card and they both compete for each others car. If you only play in single player mode, you’ll never get to play this mode in any practical sense. What’s worse is that if you complete the game, the benefits of this mode, as far as the game is concerned, is virtually non-existent. By the time I was completing the game, I had well over a million dollars between what I had cash in hand and in prize cars. The only benefit to this mode is if both players are only part way through the game. Otherwise, the small window in which this mode becomes beneficial can easily be missed. While the caveat to this mode isn’t as big as the Hot Pursuit mode in the previous game, it is still a fairly large caveat. In one player mode, there are essentially three modes of play. One mode making its return is hot pursuit mode. While this is an interesting concept with its features, there is no real benefit for the player other than posting a fast time. Cops will not only try to pull you over in this mode, but also lay out spike strips and set up road blocks. Complete the two laps to win. While this is nothing new as far as the series is concerned, what is new is the ability to play the cop. Unfortunately, because you really don’t seem to gain anything from this mode of any significance, this mode ends up being little more than a curiosity. In addition to this, there is a single race mode. You can either compete in a full grid situation, duel situation, or race solo. The benefits of this is that you can get used to racing against opponents without spending a dime. There is also a test drive mode where you can freely race alone. The real two modes stem from championship mode and special events mode. This is where the real meat and potatoes of the game resides. In either mode, you get to compete in various racing competitions. You can swing by the car dealership, buy a car based on the event, then try and win cash each race. If you win, you’ll not only get a bonus prize purse, but also a trophy to add to your collection. In championship mode, you have 6 competitions. Each race in each event allows you to not only win cash, but also championship points. The better the ranking, the more championship points you get. The benefits of championship points extends to individual races themselves. The higher the ranking you have, the further ahead you get to start. If you are in the lead, you even get to start in the pole position. As you win trophies, you’ll not only unlock race tracks, but also special events in the process. If you are wondering where some of the modes you’ve seen in previous games are, look no further than the special events. While some special events are limited to a single car, others have interesting characteristics. One mode is the Open Road races. Not only are you pitted against computer opponents like other races, but you are also evading the light traffic that randomly populates the road. Another mode, which happens to be a favorite of mine in this franchise, is knockout. Nothing has really changed in this mode. In each race, whoever finishes last is eliminated until only one contender survives. The open road knockout challenge combines both open road and knockout rules. A few things are unlocked in this mode. While it may not look like it at first, this game retains the vehicle class restrictions. If you race with a particular vehicle, your opponents must match that particular class. While many races restricts what you can race with, other races don’t have this. Once you are aware of this class rule, you can race in some of these “grueling” races with the slowest cars in the game. The huge benefits of this are the fact that your car is generally much more agile to handle some of the more difficult courses. So, every chance I got, I raced with my fully upgraded BMW Roadster to make quick work of these events. One feature that is new is the monetary system. You can buy and sell cars throughout the game. Part way through the game, you might find yourself constantly low on cash. Selling cars and completing special events can help with this, but you’ll probably have to race some championship events twice to get much-needed cash. The biggest expense is usually you buying the next car. The cars you need to buy can range from 20,000 to well within the 6 figure range. Car upgrades, though helpful in races, can also put a dent in your pocket book. The other feature in this game is the ability to upgrade cars. These upgrades are extremely limited. Level 1 usually upgrades handling (it also lowers the car to the ground). Level 2 will bump up the high speed (and add racing stripes to the car). Finally, level 3 will increase acceleration (and change the color of the cars rims). While these upgrades are limited, they are certainly better than nothing. While a lot can be said about the benefits of all of these features, the game quality is somewhat muted by the tracks you get to race on. You’ll race on the first track and find the road rather windy. You’ll get to race on another track and find that, too, was windy. Eventually, you realize that every track is extremely windy. It was as if the track designers said that a flat straightaway is a terrible thing to have in a track. The result is the fact that every track is virtually the same as far as basic design is concerned. The only times the tracks get interesting is whenever there is a split in the road. Otherwise, it’s almost all the same with a few tight corners. The upside to these tracks is the fact that there are at a half decent length. There is also a nice number of them available in the game. You’ll be encountering new tracks from beginning to end. The game length itself is surprisingly half decent as you are looking at anywhere between a day and a half to three days to play through everything. Another upside to these tracks is that there are three things that can change. For one, it is possible to race the track backwards. For another, it is possible to race the mirror version of the track. Thirdly, it is possible to race the tracks at night (night driving is significantly improved over the previous game). Finally, you can activate weather (generally rain) to make conditions more slippery. This adds huge variety to the game and keeps things interesting from beginning to end. A downside to the gameplay itself, however, is that the handling is generally quite poor. I had to adjust my racing strategy to something that closely fits with Rush 2: Extreme Racing USA. Even then, it wasn’t the greatest match as the game has the sliding and spinouts found in some of the poorly configured cars in Gran Turismo 2. In short, it was the worst of both worlds combined into a single game. That’s what makes the game trickier than it looks. On the surface, it looks like nice wide tracks that can be easily navigated. Unfortunately, the wide tracks are a compensation to the poor handling of the vehicles. One last feature of note is the Safe Driving Bonus/Repair Bill feature. If you manage to keep your race free of collisions, you’ll get a nice cash bonus for safe driving. If you hit anything (be it your opponents, guard rails, invisible walls, or even breakable signs), then you’ll be forced to pay a repair bill at the end of the race. Typically, this can be covered if you win the race, but not always. So, you can choose between trying to keep your race clean or let repair bills be the cost of doing business. One important note, you can’t incur damage from jumps or driving on grass, dirt, or sidewalks. Small bills generally come from signs you thought you just barely avoided. As far as the series is concerned, this game is a step forward. While the organization of the events can be a little odd, there’s a large number of improvements to be had. Unfortunately, once you start to get into comparing it to other games, this is where the loses ground. While the weather is a great feature, there is very little else this game has to offer that isn’t already found in other games. In fact, a number of these features (such as car upgrades) seem rather primitive by comparison. Other games such as Gran Turismo and Rage Racer have long boasted of some of the features found in this game. Once you start talking about games from other systems, this game only falls further behind. I found that the races in tournament mode can be quite dull at times. If it weren’t for me trying some of the special events part way through, I would have grown bored of the game itself. The special events do help make this game more interesting. In fact, they are enough to help get me to the end. Still, you may find that you need to take the tournament mode in small portions because it is quite lackluster. Generally speaking, this game is an improvement over the previous games in the series. Unfortunately, with the other games out there at the time, this game falls behind in spite of the modest improvements. The tracks themselves can be dull and repetitive in terms of design. The features such as the money system do make things more interesting. Unfortunately, the special events mode is the only thing that really saves this game. Otherwise, this game does have a habit of dragging from time to time. Graphically speaking, the news doesn’t get any better for this game. While the overpasses, mountains, and windmills do keep things visually somewhat interesting, it only keeps the tracks from looking boring. The low end textures, unfortunately, do this game few favors. The only time things get interesting visually is when you drive through some of the tunnels or race in the snowy level (incidentally, also the most annoying track in the game). The subtle reflections on the road in the rain was decent enough, but it wasn’t enough to really save this game in any significant way. The audio was depressingly bland. In the game itself, the music ends up being little more than the occasional percussion with the odd synth and sample here and there. The best track in the game, for me, was Liquid Plasma. Even then, that track can be forgettable in the face of a game with a decent score. The engine and collision sounds were decent, but nothing other games haven’t done before. The only time the sound gets interesting is during Hot Pursuit – a mode relegated to some side feature with no real benefits. At the end of the day, it left a lot to be desired as it only made the races that much more bland. Overall, this game is a step forward as far as this series is concerned. Unfortunately, if you are looking for great racing games released at the time, you’re better off looking elsewhere. The money system does spice things up a little and the upgrade system (both cars and general upgrades) do spice play up. The only decent feature was the special events mode. Though an odd way of organizing these other modes, it’s the only thing that prevented this game from becoming truly boring. The graphics were somewhat bland with only a few interesting features. The audio was also rather bland. So, not the greatest game in the world even with the minor improvements. Furthest point in game: Got all gold medals.